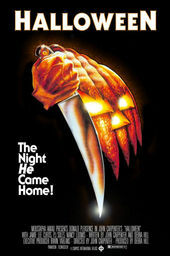 John Carpenter’s menacing theme for Halloween sends some into a panic and some smiling. Composed and performed by the man himself, Carpenter’s influences were Bernard Herrmann and Ennio Morricone, with whom Carpenter worked on The Thing. The opening sequence shares some similarities with a film that Carpenter adores, Roy Ward Baker’s Quatermass and the Pit. The sequence plays like a blackhearted processional we’d like to writhe away from but the pull of this simpleton’s grin has us ensnared. A flicker to contemplate and a well-timed fade to black leave only Carpenter’s credit and his music. And our eyes, open with fear.